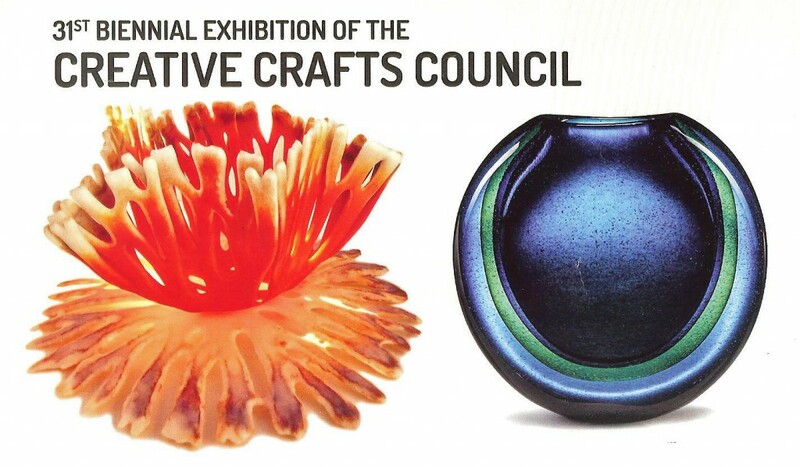 The Creative Crafts Council (CCC) celebrates its 31st biennial exhibition supporting the finest crafts from Maryland, Virginia, and Washington, DC. The first biennial had bold beginnings as the Exhibition of Creative Arts at the National Collection of Fine Arts, now known as the National Museum of American Art, and today continues a long tradition of exhibiting at Strathmore Mansion. The CCC is made up of the Potters Guild of Frederick, Washington Ceramic Guild, Washington Guild of Goldsmiths, Fiber Art Study Group, Capital Area Woodturners, Potomac Fiber Arts Guild, Montgomery County Woodturners, National Capital Art Glass Guild, The Kiln Club, Montgomery Potters, and National Enamelist Guild. In this 31st annual juried exhibition, you will see traditional media from these guilds and beyond, representing excellence in fiber, enamel, wood, glass, ceramics, metals, and mixed media. ​Maurine Littleton: Maurine, daughter of Harvey K. Littleton, is the owner and director of Maurine Littleton Gallery in Washington DC. The gallery exhibits and represents leading contemporary artists in glass, metal, and ceramics. Rebecca Stevens: Rebecca has been the Consulting Curator of Contemporary Textiles at The Textile Museum in Washington D.C. since 1980. She has lectured on five continents, served as curator and as a juror for major fiber exhibitions both nationally and internationally. Matthew Hyleck: Matthew is an artist, teacher and the Education Coordinator at Baltimore Clayworks. His work is represented by six galleries across the country and has taught a number of workshops in the northeast, United States. Foon Sham, Escape I, Tunnel, 2016. 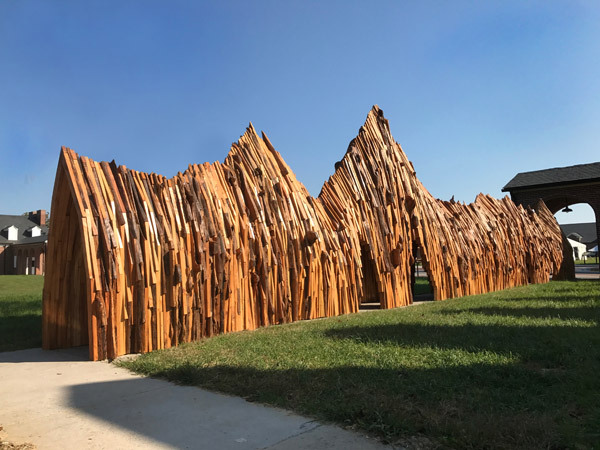 Pine, 14 x 62 x 5 ft. 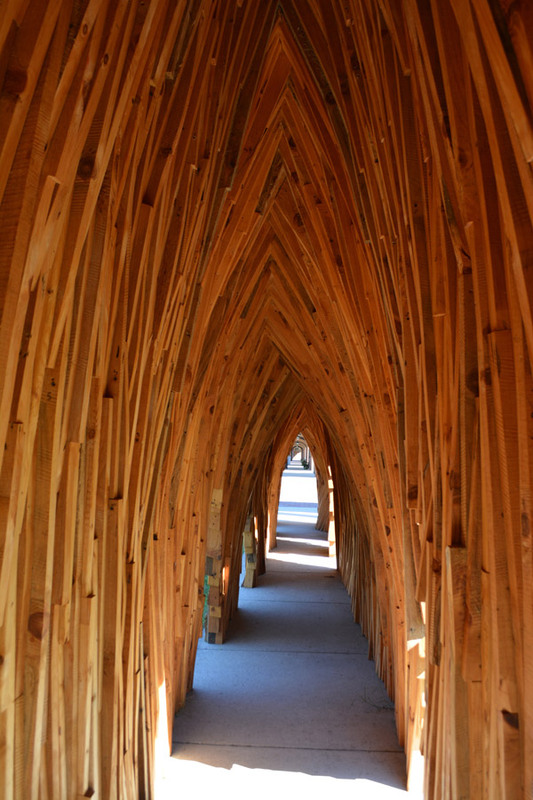 Artist Foon Sham’s focus is on wood in its many forms. Using small bits, he creates large scale vessels which take on shapes like tornados or mountains, baskets, or even a giant vase-like piece which viewers can sit inside. His smaller works echo these larger structures, exploring the intersection of natural vs. manmade, permanence vs. instability, geometric vs. organic. 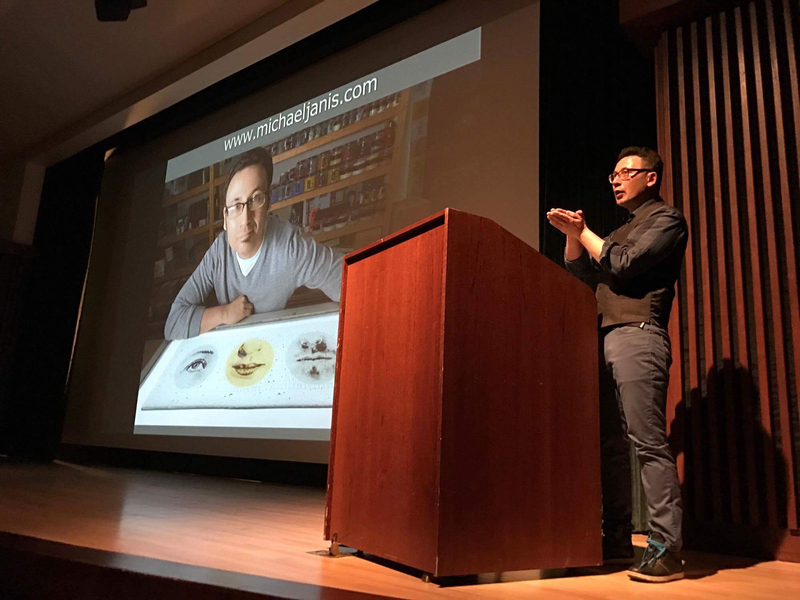 Foon is a professor at University of Maryland, and exhibits nationally and internationally. The James Renwick Alliance (JRA) presents the annual Distinguished Artist Series with “local treasures” featuring craft artists who contribute significantly to the richness of the artistic environment in our area. Foon Sham will discuss his international background and experience and his body of work in wood and other media. Foon’s workshop will highlight some techniques for creating his wood pieces. The lecture will focus on his international background and experience and his body of work in wood and other media. 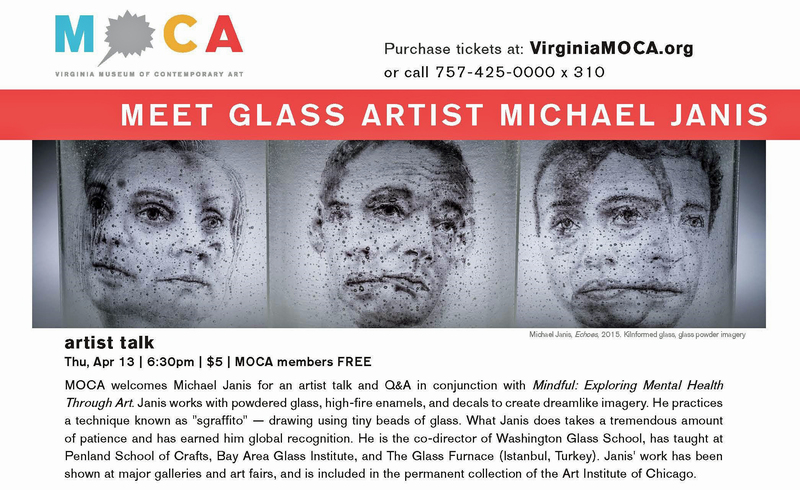 Virginia Museum of Contemporary Art (MOCA) invited WGS’ Michael Janis to talk about his artwork in the exhibit “Mindful: Exploring Mental Health Through Art”, his glass process, and the themes that run thru his work. 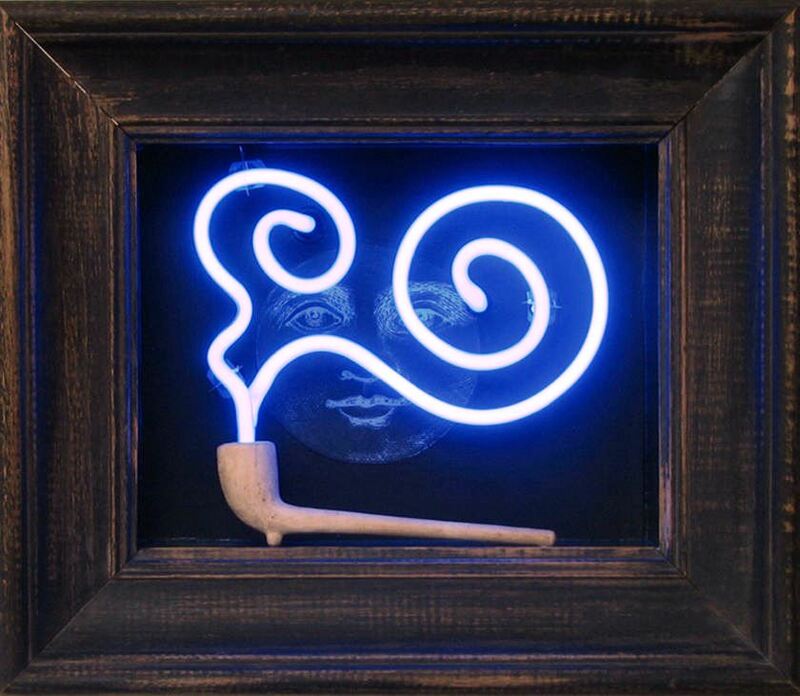 “The Blue Light” by neon glass artist Eve Hoyt . Glass smoking pipes get the high art treatment at a new exhibit that opened at the National Liberty Museum (NLM) in Philadelphia, PA.
“Freija,” a glass pipe sculpture by glass artists Banjo and Snic Barnes with assistance from Tyson Peltzer and Tristan Hodges, will be on display at the NLM’s “The Treachery of Images” exhibit. Titled “The Treachery of Images,” the exhibit, which runs through May 7, features glass hand pipes and water pipes from more than 20 prominent pipe-makers and other glass artists. Work on display at the exhibit will also be available for purchase. The exhibit takes its name from a 1929 painting of the same name by surrealist artist René Magritte. Featuring an image of a pipe underlined with the phrase “Ceci n’est pas une pipe” (or “This is not a pipe”), the painting challenges viewers to question their interpretations of reality by pointing out that the painting is not a pipe, but a representation of a pipe. The NLM’s “Treachery” exhibit will operate on a similar principle, placing the often-maligned functional glass subculture in the type of space usually reserved for the mainstream art world, which historically has marginalized pipe-makers due to their art’s association with smoking marijuana. In that way, the exhibit seems to ask viewers to consider that the pipes at NLM aren’t pipes, either — or at least not just pipes, but also works of art. Exhibit runs through May 7, National Liberty Museum, 321 Chestnut St. Philadelphia, PA 19106, www.libertymuseum.org. Washington Glass School Job Opening! Washington Glass School is Hiring! Washington Glass School (WGS) is excited to announce the hiring of a new full-time glass studio coordinator. 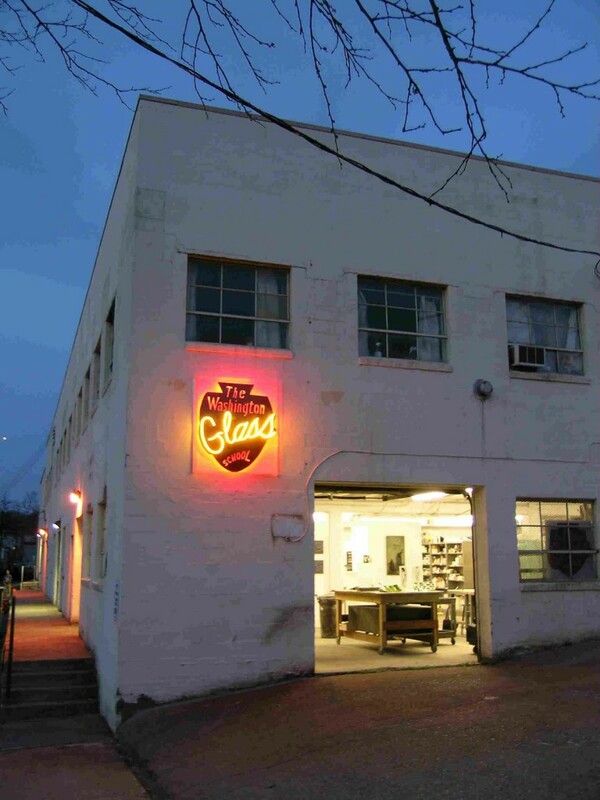 WGS seeks a creative and energetic manager and teacher for a kiln cast glass studio in Mt. Rainier, Md. just outside Washington, DC. Washington Glass School is a private art studio which focuses on warm glass and mixed media sculpture. 1). 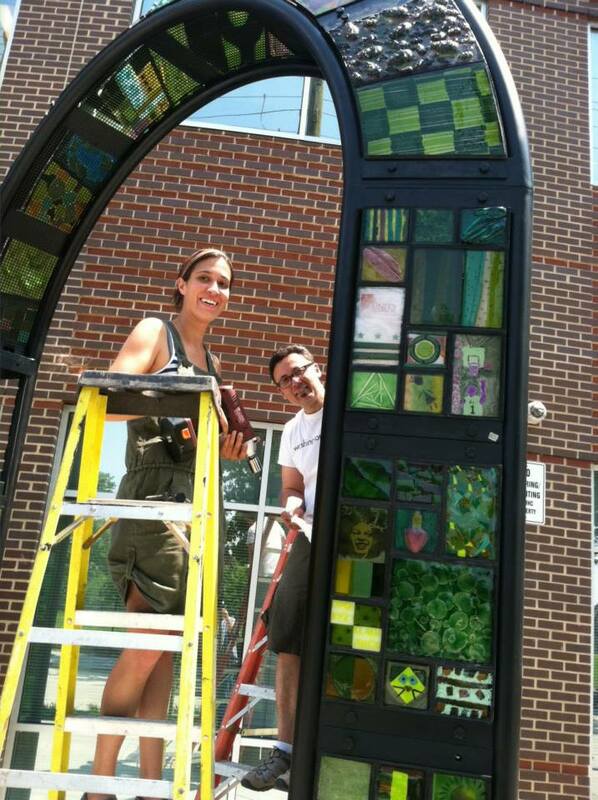 Engaging the surrounding metro area with large scale community involved public art works. 2). Teaching kiln casting classes and others that support our sculptural mission. 3). Production work for several artists who are based here, including acrylic /resin casting and mold making. Candidate cannot be allergic to these. The Glass Studio Coordinator will be responsible for communicating with all of these audiences and ensuring that the studio is serving their needs. 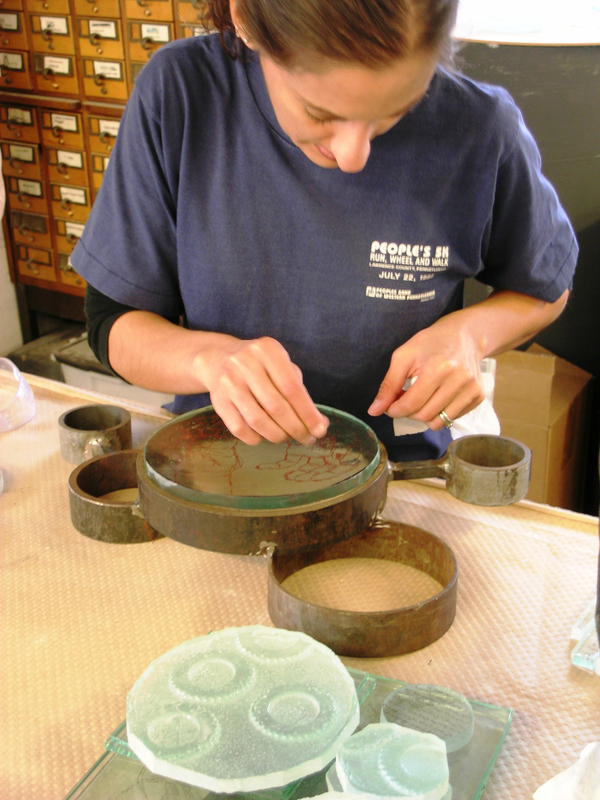 We are looking for someone who is equally excited about glass education, mold making, acrylic casting, glassmaking, and managing and promoting the studio. 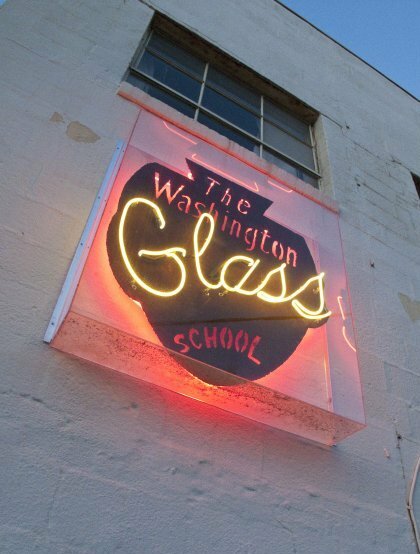 The Washington Glass School Studio Coordinator should be self-starter who can independently manage studio activities, as well as collaborate closely with WGS’s staff on an overall strategic vision for the organization and its execution in the glass studio. • Serve as a public face for WGS: act as primary liaison for studio renters, answer calls and emails about studio, interact with visitors, attend events on behalf of WGS. • Manage and assist several artists principles with their work. • Travel to international art fairs to represent WGS artists, with duties including show set-up, sales, packing, shipping and take down. • Manage studio inventory and purchase materials and tools as needed. 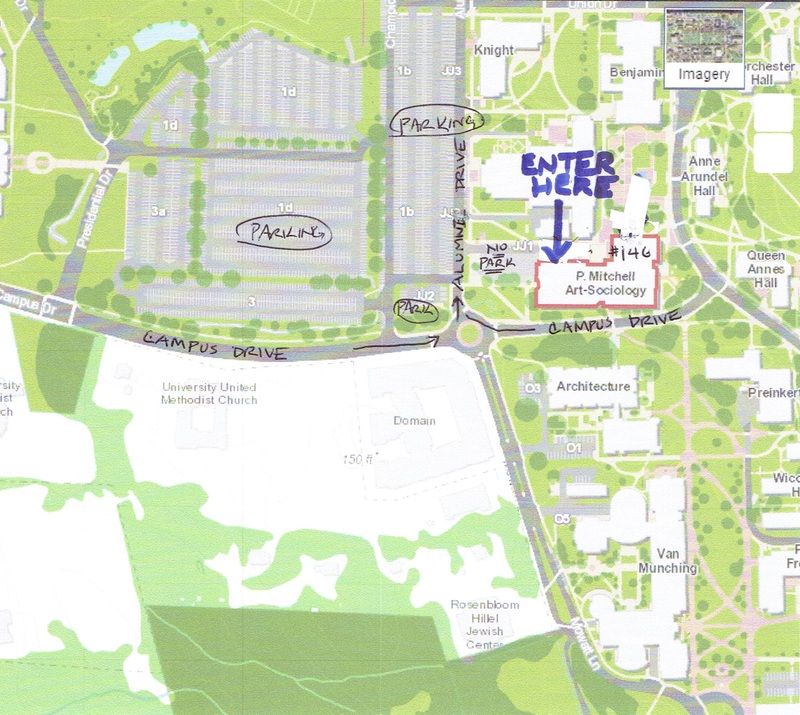 • Help oversee and fabricate large scale public art pieces, including community involvement work shops. 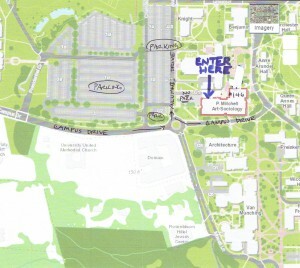 • Attend weekly staff meetings and monthly teaching artist meetings. • Good written and oral communications skills; ability to interact with all of the audiences at WGS. Intelligence is better than brawn ! • Ability to work as a part of a team while working independently on projects to meet multiple deadlines. • The ideal candidate should very much want to further their own art career and would benefit from their time here. • Metal welding, acrylic casting and electronic wiring background would be helpful, but candidate can be trained in this. • Speed is of the essence here on projects. Speed, staying on task and attention to detail are paramount. Hopefully someone who will treat each work as their own for quality control. 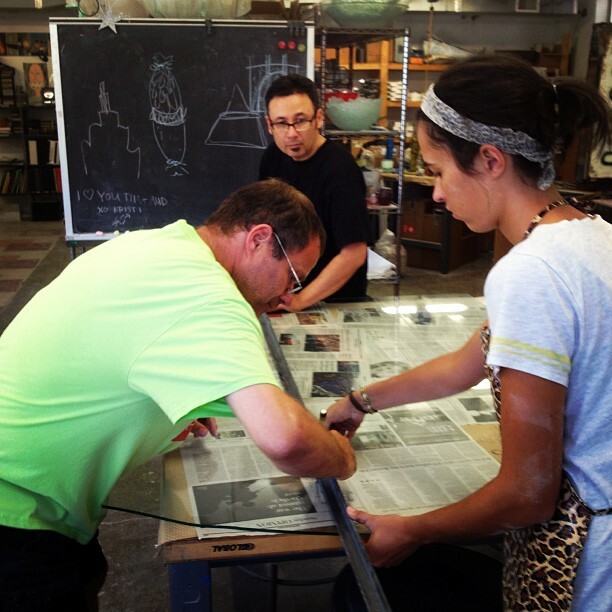 The Glass Studio Coordinator is a 35/40-hour/week position, including some evening and weekend events. Salary is commensurate with experience. It includes both an hourly salary and teaching bonuses. This is an extremely busy studio. ~ you will have the opportunity to sell and show your work at some of the international art fairs, such as Context Miami, Expo Chicago and Affordable Art Fair in NYC. Benefits also include assisted health insurance and kiln time at WGS as well as use of all equipment and a dedicated work area for your own art. Access to all equipment. Materials at cost. This is the ideal job for those who are seeking a career as a full time studio artist. To apply, please submit a cover letter telling us why you might be a good fit, your resume, and images of past work to: TimTateGlass@aol.com.